The Burmese authorities have returned opposition leader Aung San Suu Kyi to Rangoon as they extend their crackdown against pro-democracy campaigners. The leader of the National League for Democracy (NLD) is reportedly being detained at a government house in the capital, while security forces have surrounded the homes of other figures in her party, effectively placing them under house arrest. The military authorities have also ordered universities and colleges to remain closed indefinitely, cancelling a new term that was due to start on Monday. The BBC's Larry Jagan says university campuses have been at the centre of political activity, and the authorities are worried that students may organise protests against Aung San Suu Kyi's renewed detention. Most of the NLD's offices around the country have been closed by the authorities, while opposition sources say the military authorities have also begun to take into custody many of the party's key provincial leaders. The clampdown follows clashes between NLD supporters and pro-government protesters in the north of the country on Saturday. Aung San Suu Kyi was visiting the region at the time and was detained there. Britain has called for the immediate release of the opposition leader, while the United Nations Secretary General, Kofi Annan, has urged the regime to start a serious dialogue with her rather than detain her. 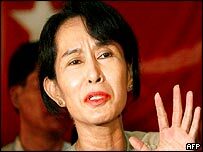 There are fears that the extended crackdown on the opposition may mean that the generals who run Burma are planning to put Aung San Suu Kyi back under house arrest. She was released from a long spell under house arrest last year - a move welcomed at the time as a sign that the junta was ready for political reform. But she recently attacked the military for the slow pace of change and their apparent reluctance to start political talks, and tensions have been rising between the opposition and the government. Last week, 10 members of the pro-democracy movement were sentenced to stiff jail terms for organising public protests and being involved in clandestine activities. Our correspondent says Burmese officials have been warning Aung San Suu Kyi's supporters not to incite unrest during their travels outside Rangoon. He says she is being blamed for clashes which occurred while she was on a political tour of the north of the country. The military said four people were killed and 50 injured in the town of Yaway Oo, about 560 kilometres (400 miles) from Rangoon. 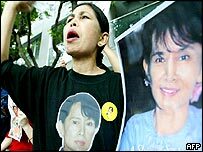 The NLD won elections in 1990 by a landslide, but the military regime which has run the country since 1962 refused to hand over power. Aung San Suu Kyi has spent much of the last decade under house arrest, but her popularity among the Burmese has not waned. After a seven-month interlude, the military junta hinted last month that it wanted to meet her again, raising expectations that the dialogue process between the two sides could be resumed. But her detention, recent violence and last week's convictions of pro-democracy campaigners are thought to have seriously undermined those hopes.